Good morning. It seems to be a little dreary and rainy all over the place today and hopefully this fun and cute card will bring some cheer. This is a very unusual color combination for me. Natasha's card is just lovely. 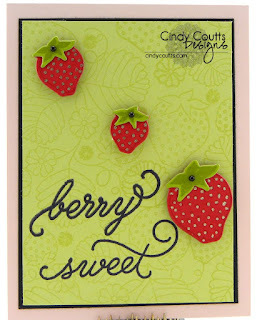 I used Berry Patch and Berry Patch sentiments with a Sweet Blush card base, a Basic Black mat, and Spring Moss. I stamped the Spring Moss card stock with the large image from Berry Patch using Versamark. I die-cut 3 different sizes of strawberries and their tops using Pure Poppy and Simply Chartreuse card stock and then stamped the coordinating image and ink color onto the die-cuts. I colored in the "dots" of the strawberry with a little silver glimmer marker but now wished I had used black as it makes better sense so I just might redo the card as it was simple enough to put together. 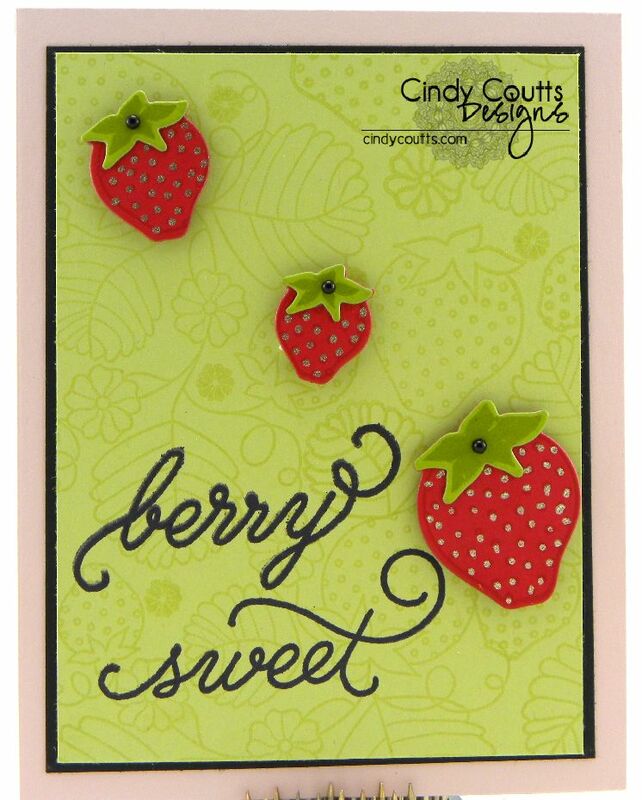 I added some small black gems to the center leaves of the strawberries and adhered them to the card with foam tape. The sentiment was stamped with True Black ink. Thank you for stopping by to visit us today and I hope you like this card! jolie carte !!!! j'aime. Pretty card, I like it ! Those little black gems are perfect in the leaf centers!